Our classes are fun and adaptable to every fitness level! Try Pilates Mat, Cardio Muscle, Thai Chi, Yoga, and more! Like to cycle? We offer a variety of cycle classes at both One to One and Next Level Fitness! Did you know you have a greater chance of staying active and achieving your fitness goals if you attend group exercise classes? Research shows it. We have over 80 classes per week and have the choices to keep you motivated and challenged. And all group exercise classes are free for One to One members! Peruse the One to One Group Exercise calendar online, add our classes to your personal calendar, share them with your friends or print out the season’s schedule. Ask the instructor to help you learn target heart rate and understand heart rate response. If you arrive late or leave early, you should still warm up, cool down and stretch. Do not enter if 15 or more minutes late. Group Exercise vs. Small Group Training. What is the difference? 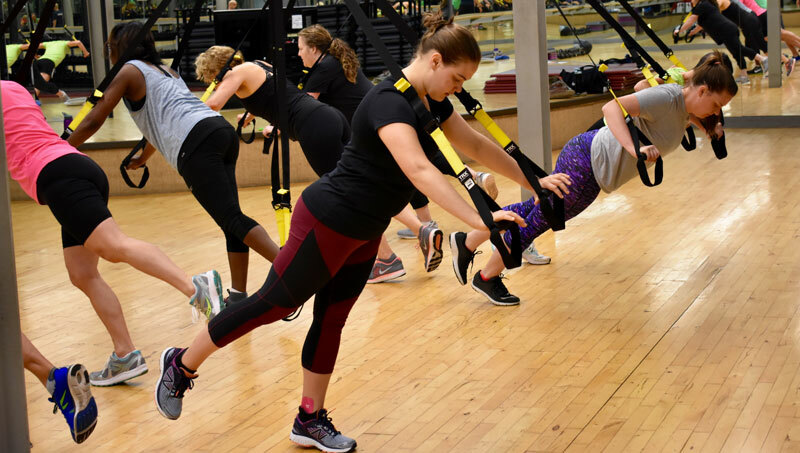 Our main group exercise classes are free to all One to One members and guests! ‌View the current schedule via the buttons above! Our Small Group Training classes (TRX, Kettlebell, and Total Body Training) and Pilates Reformer allow you to work more closely with the certified instructor in a small group setting for a small additional fee. ALL MEMBERS can try a small group training class for FREE! You will love these classes - check them out! Interested in specialized classes in an upscale, boutique studio setting? Head over to Next Level Fitness Studio and check out our Class Schedule to find some unique offerings!